HONG KONG TOGETHER WITH JACKIE TOUR : PHOTOS, STORIES, NEWS! 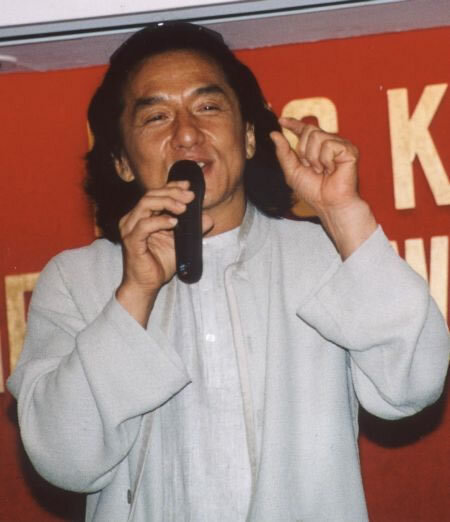 Jackie has had his hair cut for his role in New Police Story. 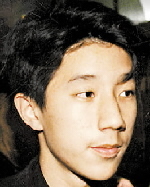 At a fan club gathering in Hong Kong, Jackie asked how his fans would prefer his hair to be. "SHORT!" So now Jackie's hair is short and many of his fans are once again happy. Of course, we love Jackie no matter what his hair looks like, right? You just gotta love the guy! Check out the fabulous new artwork in the Jackie Chan Art Gallery (scroll down to the bottom to see the newest ones). Thanks to Janie Lee for her beautiful drawings. Hong Kong Filmmart yesterday released the list of favorite actors and actresses by film buyers. 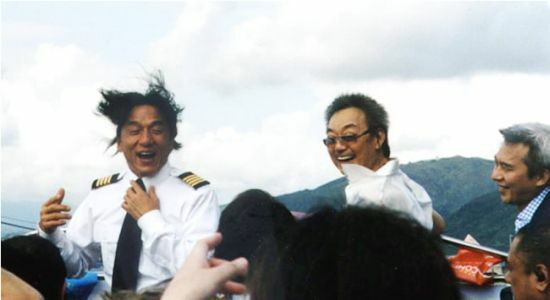 The lists include: Jackie Chan, Andy Lau, Chow Yun Fat, Maggie Cheung, Sammi Cheng, and Michelle Yeoh. 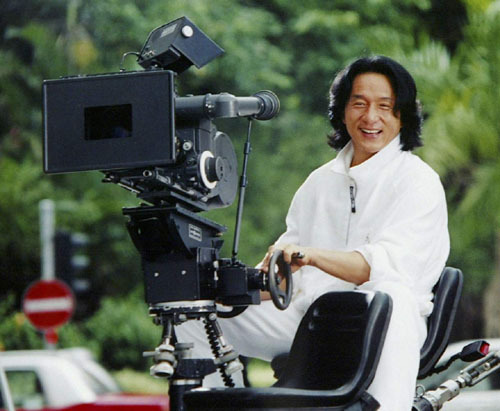 The top ten directors on the list are John Woo, Jonnie To, Wong Kar Wai, Jackie Chan, Tsui Hark, Joe Ma, Ann Hui, Andrew Lau, Gordan Chan and Yuen Woo-Ping. Congratulations to Jackie who has been tops with audiences for many years! Don't forget to check out the two latest additions to Totally Cool Things About Hong Kong....two versions of The Medallion premiere! Check out the latest addition to the Totally Cool Things About Hong Kong section of Jackie's Kids Corner! Lisa Schwark and her family have shared their memories of The Medallion Premiere in Hong Kong. Thanks Lisa, Mark, Nic, and Steph! 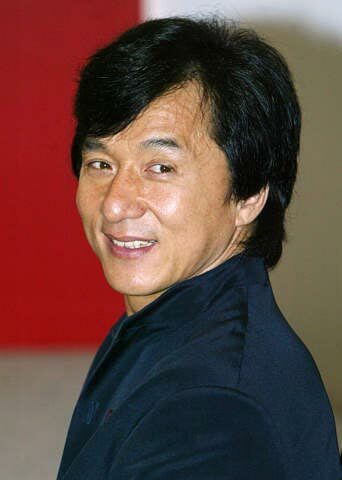 After all the commotion of the last few days (the announcement of the merge of Jackie Chan's official website with the Kids Club website and the creation of the web-based VIP Fan Club), the Latest Jackie News will attempt to get back on track. Click here for information on how the changes will affect the Kids Club. First, there is a new addition to the Totally Cool Hong Kong stories....this one is about The Medallion Premiere at the Hong Kong Convention Center! Click here to read this and other stories from the Hong Kong Together With Jackie Tour. If you would like to send a tile to Jackie to help decorate his office, click here for all the information! Check out the latest "Ask Jackie" question at the Jackie Chan Adventures website. 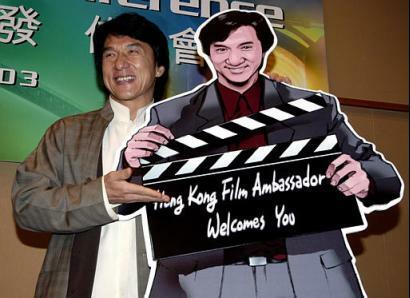 As you know, Jackie is Hong Kong's Film Ambassador. Here's what Jackie has to say about THAT! Wow! Jackie's official site has relaunched and is better than ever. There is a special VIP section where you can see things that no one else can see. Jackie's official webmaster has done a terrific job of putting together a state-of-the-art website. Congratulations!
" been invited by the JC Group to officially join their staff and will therefore be continuing running the kids corner section." For now there will be a link from Jackie's official site directly to the Kids Club website. In the future, the contents of the Kids Club site will actually be ON Jackie's official site. Transferring content from the Kids Club format to the official site format is a major undertaking and so it will be a while before this happens. 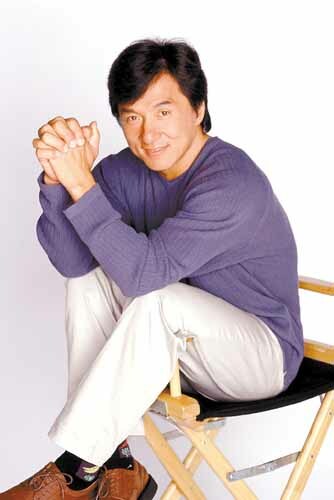 If you are an existing member of the Official Jackie Chan Fan Club for Kids, you will continue to receive a paper newsletter in the mail until the end of your membership. After your membership has expired, you can continue to read the newsletter on Jackie's official site in the Kids Corner. Each kids club member will receive a login and password in the August/September issue of the newsletter which is being mailed this week. Look for it in your newsletter. You will be a VIP member for one year after which time you will be required to join the International Fan Club. Thanks to Jackie, Willie, and Solon for generously offering to allow kids club members to roll their memberships over for a year! On a personal note, I would like to say that I am thrilled with the decision of the JC Group to centralize the fan clubs. For me it means being part of the JC Team - a dream come true indeed! I will be working for the JC Group to bring you the same fun, educational, and Jackie-centered web content that I have been bringing you for two years. Because I will no longer have to deal with the immense chore of mailing out a paper newsletter, I will have more time to add creative sections to the Kids Corner. Thank you to everyone who has emailed me privately with your concerns about the decision of the JC Group. Don't worry....the kids club website will be even better than before! 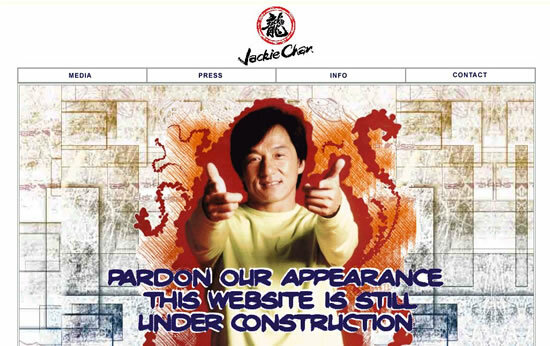 The Jackie Chan Fan Club for Kids website isn't going anywhere! The Kids Club website has officially (yes, OFFICIALLY!) 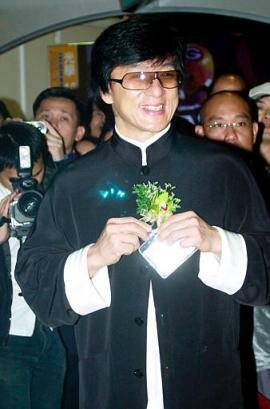 become part of www.jackiechan.com, Jackie's Official Website. Stay tuned for further details....and don't worry! Thank you to everyone who expressed concern about the future of the kids website. The announcement made yesterday (September 23) on Jackie's Official Site was no surprise to the Kids Club president/webmaster. The kids club website will continue to be the fun, educational, and Jackie-centered site that it has been for the past two years. According to Hong Kong media, actress Yeung Choi-Nei (Charlie) has been cast to play Jackie Chan's girlfriend in New Police Story. Director Benny Chan said final list the cast would be revealed during a news conference in Hong Kong September 25. This will be Yeung's first big screen performance since 1997. Maggie Cheung, who played Jackie Chan's girlfriend in the first three episodes of the series, has declined showing up for the fourth time. 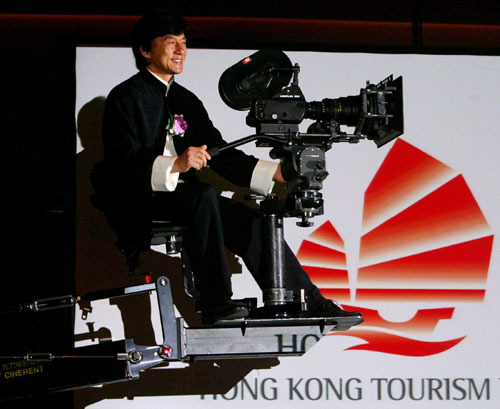 New Police Story would be the first production by JCE (Jackie Chan Emperor), a joint-venture between Jackie Chan and Hong Kong's Emperor Multimedia Group. Shooting will start soon in Hong Kong and "other places". In other news, Jackie's brand new line of clothing, JC Jeans, is preparing their website. JC Jeans will, according to the website, "be available in better department and specialty stores in February, 2003." Here's a look at the home page (under construction). If you checked the Kids Club "Latest Jackie News" early in the day yesterday, check down below because a lot of stuff was added last night. To see some AMAZING photos taken on the set of Around the World in 80 Days, click here. Be warned, however.....these are SPOILER photos. 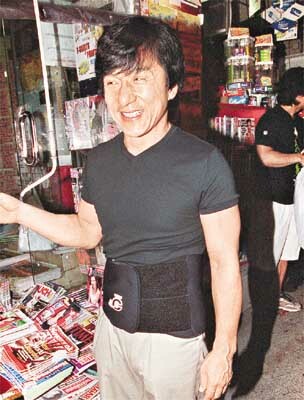 Well, if you think Jackie is sitting back and taking it easy while he's between movies, think again. He's been dashing all around Hong Kong helping to support various causes. As you can see, Jackie has cut his hair which means that he is done filming the extra scenes for Around the World in 80 Days. When Jackie was in Hong Kong he told fans that he was going to cut his hair THIS SHORT but he seems to have changed his mind! If you'd like to see the entire commercial that Jackie filmed for the Hong Kong Tourism Board, click here to go to his official site. The commercial is beautiful and makes the Kids Club webmaster want to jump back on an airplane and continue getting lost in Hong Kong. Jackie has been very busy filming a television commercial for the Hong Kong Tourism Board's "Hong Kong - Live It. Love It!" global advertising campaign. You can see TONS of great photos of Jackie filming the commercial on Jackie's official site. Also on Jackie's official site are photos of the campaign. Here's a photo of Jackie at the ceremony for the global advertising campaign. Jackie surprised the audience by coming in on a camera perched above the audience! Thanks to Marie M. for sending a link to an AWESOME satellite photo of Hong Kong. Click here to see it. It's a large file so it takes time to download, but it's definitely worth it! Remember when Jackie was filming a motorcycle ad a while back? Well you can see what the ad looks like by clicking here. Don't forget to have a look at the wonderful story written by Kids Club member Stephanie and her mom Lisa. Here's the link to this great story and all of the terrific pictures that go with it! Click here to read an awesome story about Kids Club members visiting the Giant Buddha on Lantau Island in Hong Kong. It's a great tale.....and there are lots of photos. Thanks to Lisa S. for contributing this story! 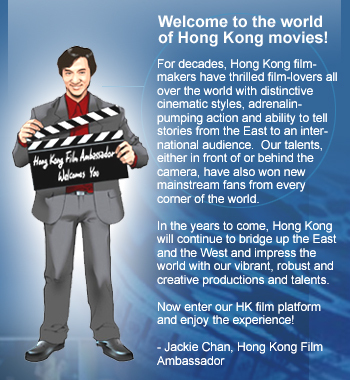 Check out Jackie's official site for dates when his commercial for the Hong Kong Tourism Board will air. Click here to go to Jackie's site to see "The Making of..." the commercial! Check out the latest adventure in the Totally Cool Hong Kong section of the Kids Club website! This one is written by Kids Club member Stephanie's mom Lisa! To see the other stories, click here. Well, the Jackie Chan Adventures cartoon has started its FOURTH year in the USA with an episode entitled "The Masks of the Shadowkhan." If you are familiar with the world of cartoons (and who isn't, right??) you know that new animated shows premiere all the time but few of them last. Congratulations to Jackie and the JC Group for a smashing success with the JC Adventures. If you'd like to see a new "Ask Jackie" clip, click here to go to the JC Adventures official site. Celebrating Mid-Autumn with a BBQ Party! Jackie Chan & Coco Lee perform cowboy dance to entertain guests! Last night on the mid-autumn festival, Jackie Chan invited over 60 friends, including Coco Lee, Ray Lui & wife, Ken Lo & wife, Asuka Higuchi, Michael Wong & his daughter to his Kowloon office roof to celebrate mid-autumn festivals with a barbecue party. According to sources, they're not only celebrating the mid-autumn festival but also celebrating the re-opening of the office. On the evening, the gathered friends were drinking beer and eating Japanese shish-kabobs around 11pm, Coco even performed a cowboy dance with Jackie for entertainment! Thanks to Tinlunlau of the JCMB for this translation. The Medallion is still playing in theaters here in the US and is doing very nicely. It has been in theaters for three weeks and stands at a respectable number 12 on the top 20 movies. the Hong Kong Tourism Board. You can even watch a clip of the commercial in Mandarin or in English. Also at Jackie's official site you can see that the Jackie Chan Tile Project is in full swing as another tile arrives in Hong Kong. Don't forget to get started on YOUR tile! Click here for all the information. Speaking of Shanghai Knights, why not go have a look at some of the hysterical places that the Shanghai Knights promotional posters were placed back when the movie premiered. They're pretty funny. Check out the updates on Jackie's Official Website! There are photos of Jackie perched on the world's third tallest building plus lots of other exciting things to see. According to BrandWeek.com, "a trio of Kids' WB! characters will urge students to 'Toon in to School!' in a milk carton program set to run at 25,000 elementary, middle and high schools this fall. In one linked to Jackie Chan Adventures, students were urged to join the J-Team and practice mind, body and spiritual fitness." For those kids who entered the Anti-Smoking Poster Contest: Don't worry! Jackie has not forgotten about being the judge. He's just very busy right now. Keep checking The Latest Jackie News for the winners! Kids Club members should not despair either. Your newsletters will be coming shortly. The editor of The Little Dragon News started a new teaching job last week and is kind of overwhelmed. She apologizes and says that the wait will be worth it! "Shooting of the fifth of Police Story series, under the title New Police Story, will start this month, according to Nanfang Daily. Director Benny Chan said the story was not too complicated and it follows the good vs. the bad tradition of previous Police Stories. Nicholas Tse will play another cop and Charlene Choi play her girlfriend. The bad guys will be portrayed by Daniel Wu, Wang Chieh, Terence Yin and Andy On. Benny Chan also said there would be a lot more hand to hand fights and less CG effects. Now the biggest unanswered question is who will play Jackie Chan's girlfriend, possibly wife?" Here's Jackie with Nicholas Tse who will also be in the new Police Story movie. Jackie's good friend Anita Mui, who played Jackie's stepmother in Drunken Master 2 (The Legend of Drunken Master) is sick. Jackie attended a news conference in Hong Kong on Friday with other friends of Anita to show support. Members of the Kids Club will keep Anita in our thoughts. Wow! It's September already. Lots of kids (and adults) are going back to school. Good luck to everyone who is starting a new school year. 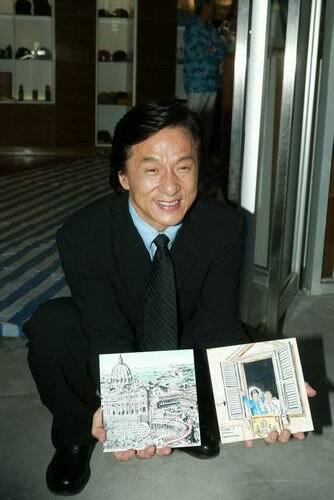 There's more information about the Jackie Chan Tile Project up at Jackie's Official Site. Click here to read it. There's further information on the Kids Club site and you can read that here. 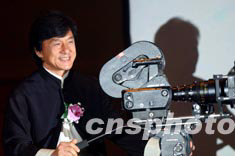 Willie Chan has announced on Jackie's official site that Jackie will indeed be doing a Hong Kong movie this year. Willie has asked for your advice about choosing a leading lady for Jackie. Click here to read the choices. If you'd like to send an email to the Kids Club president, she will forward your choices on to Willie. Click here to vote! All the votes are in and you have chosen Shanghai Knights as your favorite Jackie Chan Hollywood movie! Let's hope that Shanghai Dawn is just as good!